Evolved virtual architectures by Eric Bucci, University of Texas at Austin. Bruce Damer: President and CEO, DigitalSpace Corporation, Director, Contact Consortium, author "Avatars" (Peachpit Press, 1998), "Virtual Worlds" (Perseus Press, 1998). Bruce Co-directs a 35 institution research and development consortium bringing virtual worlds to the net. He is a visiting scholar at the University of Washington HIT Lab and a Silicon Graphics Vanguard of Visual Computing. Marcos Novak: U.T. Austin, Advanced Design Research Program, School of Architecture, and UCLA, Architecture and Urban Design; author "Liquid Architecture" (Cyberspace: First Steps, MIT Press, 1990). 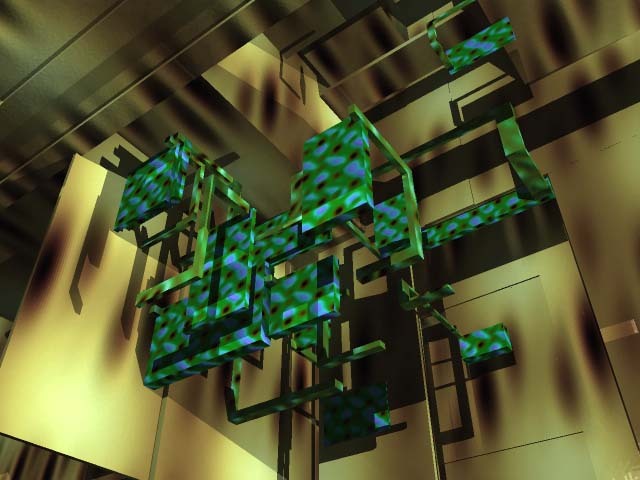 Marcos is a transarchitect, artist, and theorist investigating the tectonics of technologically augmented space. Michael Powers: President of Flatland Online, creator of 3D virtual worlds platforms and author "How to Program a Virtual Community" (Ziff-Davis / Macmillan, 1997). Michael has taught well regarded courses on virtual communities at San Francisco State University and has a technology background with Xerox, Digital and Kaleida Labs. Virtual Reality has moved from high-end, expensive display technologies to real-time, 3-D worlds on the Internet which operate at modem speeds. The migration of virtual communities to colonize these worlds brings new challenges for interactive graphics, social psychology, and the aesthetics of world design. This course gives an overview of online world technologies and applications, detailed explanations of how to develop and foster successful worlds, and a discussion of the degrees of realism that are desirable in virtual worlds. We will focus on worlds in which users can build their own spaces and create their own community structures. This course is intended for graphic designers, online artists, virtual community developers, and engineers wanting to understand the psychology and aesthetics of virtual worlds and to deploy real-time person to person systems. This is an beginner to intermediate course presupposing a familiarity with the Internet and some experience with 3-D graphics. What is an online virtual world? Bots and agents, when are they useful, or why not to make "sucky salesbots"
Pay as you teleport avatars or open source worlds: what lies ahead? Each block contains ample time for audience interaction (20-30 minutes for audience questions) and the spontaneous contributions of participants connecting in virtually. One of us will always be monitoring the live virtual worlds for input into the course as it progresses. 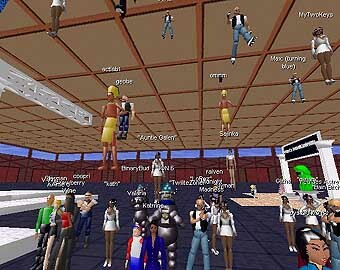 View of users gathering inside the Traveler Utopia community space and communicating using streaming attenuated voice driving avatars with lip synchronization. We will use team teaching and contrapoint approach, asking the toughest questions of each other as we go along (trying to beat the audience to the punch!). All of us have either used each other's books as class reading or have jointly presented courses so we know each other's work well. There are far more open issues in virtual world cyberspace than the successes or failures of working systems can address. We will try to suggest to the audience that this area still remains a vast unexplored country and invite their input. In past renditions of this course, we have all employed dozens of virtual presenters, people connecting in from all over the world who have specific experience and opinions on the design of their worlds and their lives within them. As many of the environments support live audio (as in the one in the figure above), virtual presenters can directly address and hear the audience. Special 3D areas will be constructed for the course in which we will try to capture the key themes using objects as metaphors. Returning to this "course world" will provide attendees a coherent conceptual framework throughout the day. We will also provide all of the software, interfaces and worlds for the CAL and Digital Cafe. Indeed, the course world should be open to SIGGRAPH attendees in the CAL to "jack in" and contribute live. All virtual worlds will be left online, text logs, screen shots of the action and commentary to provide assets for the future. Elements of this course have been covered in prior SIGGRAPH conferences, especially in the "virtual reality" track. These have focused primarily on technological issues coupled with design. However, due to the relatively recent combination of compelling 3D graphics with multi user virtual communities, we believe that this is a novel course area. We are convinced that it is of great relevance and interest to the SIGGRAPH audience as the migration of millions of users of text-only virtual communities into compelling 3D worlds will generate a significant new application of computer graphics. Indeed, the common use of 3D virtual worlds by millions of people on a daily basis will be a highly visible achievement of 25 years of SIGGRAPH community effort. All the presenters have offered full courses in this specific topic at their respective institutions. Direct ancestors to this course were presented at: CSCW96, CHI97, CFP97, Xerox PARC, UC Santa Cruz, UT Austin, BayCHI, The Banff Centre, and IBM CASCON 98. These course notes will be formatted appropriately and provided to Siggraph for reproduction. Each of us has authored books on the topic area and so could work with our publishers to offer educational discounts to attendees who wish to acquire the books prior to coming to or following SIGGRAPH. We will also provide the auxiliary materials of a compendium of papers from our research, if these cannot be included with the printed version of our course notes. Lastly, the 3D world we construct for the course will be open and available at no cost to all attendees for an extended period of time following SIGGRAPH. We will use the standard SIGGRAPH setup. Enough workstations to permit audience participation would be a benefit (and we have all done this for our classes in the past) but we understand the prohibitive cost this might pose to SIGGRAPH. However, we will invite attendees to connect into the custom built spaces for the course from the CAL or from home. 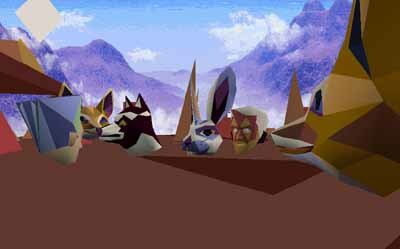 We will even try to continue elements of the course following SIGGRAPH by meeting attendees in the course worlds. 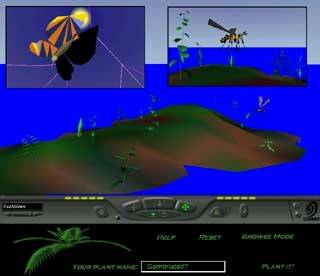 Scenes from Nerve Garden at SIIGGRAPH 1997: a shared object re-generative world whose scenegraph is regulated by a simple simulated ecosystem. These were taken from the siggraph 99 site and the checklist, perhaps our most important guide, is not on the site now. suitable for publication and received by 22 April 1999. Some level of travel and expense reimbursement is provided to course presenters. recognition you will receive if your work is accepted by SIGGRAPH 99.
your printed, signed Submission & Authorization Form. 99 Courses Submission & Authorization Form. speakers, your course cannot be accepted. Compile the following items into a file and submit it electronically. affiliation, and a short biography (100 words or less). Program and Program & Buyer's Guide. topics as crisp as possible. course, and provide an estimated timeline for the course. are considered more favorably during the review process. I have included ideas for innovative methods of presentation. why it is of interest. the organizer plans to provide. of including auxiliary materials with course notes.